. Published on January 3, 2018. Feature differences between free phones and local area codes. Despite all the recent sociological hype about how tech-savvy youngsters are making phone calls obsolete, telephones are still a basic channel for businesses. Website widgets, social media and VoIP may be handy for some of your customers, but conventional telephone calls are unrivalled in terms of easy access and reliability. Many people use it just out of habit. Thus, a start-up owner is likely to ask the following questions: Do I really need a business number and if I do, should I opt for a toll-free? At MightyCall, we are happy to share our research and answer these questions for you. Why is a virtual phone number good for business? Once you buy the virtual number, it’s always at your disposal. Moving to another location, switching to an alternative provider, losing your personal cellphone… Changing your contacts on all your marketing materials is no longer required. It’s easier to stay connected. No need to monitor multiple phones — calls are forwarded to any desired endpoint (or to several locations simultaneously). If you subscribe to a good virtual phone service, all other communicational channels can be integrated: turn your portable device into a powerful communication hub. Your contact data becomes consistent. An ability to assign extensions to specific departments/employees/divisions saves your customers the trouble of remembering several numbers or figuring out which of the published contacts to use. It’s also possible to activate as many inbound phone channels as required. Extra privacy and security are gained. Publishing your personal contact data in open sources is a bad idea. A virtual business number helps to separate work from private life; it drastically reduces personal vulnerability to scams and pranks. Your promotional activities project a professional attitude. SOHO owners sometimes use their personal emails and numbers for promotion: business cards, websites, even billboards. A free email service domain and a mobile number are equal to admitting that you work alone. With a virtual business number, a corporate social media profile and a professional email address, your business looks more trustworthy. So, your company has (or plans to purchase) a virtual phone number, but should you make it toll-free? Of course, a freephone is indispensable for fully-fledged call centers, helpdesks and globally operating online companies. However, it doesn’t mean that a local presence has no benefits. On the contrary, in some cases a local business number can be a better alternative, especially for small business owners. Now let’s discuss certain aspects which can render a local number more advantageous both for the customers and entrepreneurs. Obviously, toll-free numbers are immensely useful if your customers are located all over the country or even all around the globe. It’s always a good idea to remove any additional barriers between your services and prospective clients: they won’t have to calculate how much it will cost to get in touch with your office or whether it’s worth the money. When your business is fairly small but has a certain number of international connections, there is an initial desire to supply a free of charge calling option to help your overseas partners but this may be misleading. You will quickly find out that international calls are expensive and there are no business benefits from increased communication expenses, right? Secondly, it may be impossible for foreign callers to get through to your American number for free (depending on the specific country and number provider) or it may require additional arrangements / incur extra charges. Thirdly, your international partners are probably used to paying for their long-distance calls and will contact you via phone only if the matter is truly urgent, so a lack of freephone will hardly affect international negotiations. You do need to provide alternative means for instant interaction. Thankfully, we have the internet with its Voice-over-IP capabilities. Again, a VoIP can also be integrated into your virtual call-processing system. If you get regular calls from only a few specific regions (say, where your customers or suppliers reside), then consider buying a local overseas toll-free number. You will be able to forward calls to your location via a virtual phone system and the charges will be considerably less. On the other hand, if you operate within a local area code or if your company has only a few regional divisions, getting one or several local business phone numbers might be a better option than a national freephone. 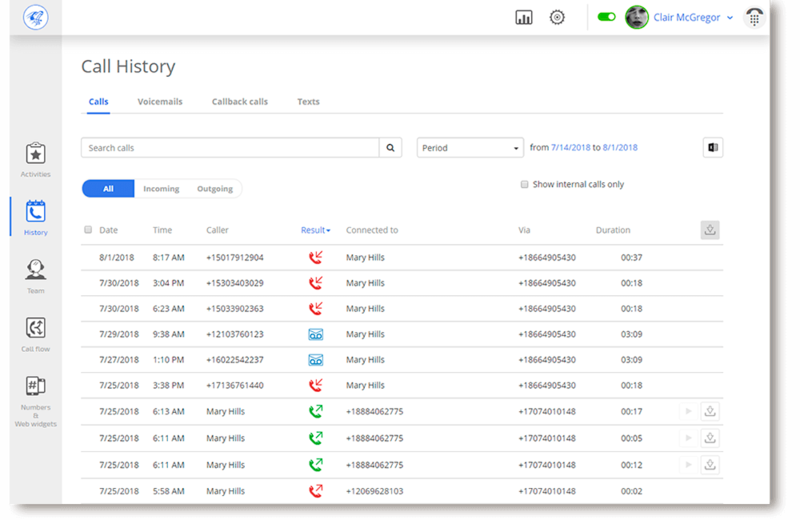 Modern virtual phone systems support multiple phone numbers connected to a single system, thus creating a unified communication environment for consistency and efficient management. Why is a local presence better? It’s all about customer perception. People consider a toll-free number to be a sign of a large company operating on a (inter)national scale. For some entrepreneurs, projecting this kind of image may be a clever marketing move, whereas others risk losing a portion of local clientele. An 800 number implies that a company is situated somewhere far away even if the office is right next door. There is also the possibility that a first-time caller may think that his call will be directed to a huge corporate (or even worse ― outsourced) call center. Why is that a problem? Some of them are especially notorious for total lack of competence and long response times. That’s exactly what a caller might think when he sees your toll-free virtual phone number. Even more so, if your marketing campaigns emphasize a “serious global business” image. According to a survey by SinglePlatform, 86% of consumers consider local businesses a better alternative to national/international companies in terms of quality. While respondents believe that national chains offer more competitive pricing, 72% of participants find it acceptable to pay more to local companies if they provide better quality. Furthermore, 79% believe that local businesses are more reliable. This opinion is quite justified ― as a rule, local companies are small-to-medium, which means that an individual customer is much more valuable to them. Additionally, when you operate within a limited area, your reputation among the locals becomes a crucial asset. In terms of marketing, a toll-free business phone number becomes a valuable instrument when promotional campaigns are not concentrated on a limited location. Online companies, whose physical location may be obscure and not actually relevant, tend to purchase 800 numbers to enable clients from various areas to contact them free of charge. With this strategy implemented, distant customers are considerably more likely to contact you via phone. Willingness to answer a call is also something to consider. If for some reason (target marketing, surveys, quality control or various confirmations) you have to call your customers regularly, toll-free business numbers are again a disadvantage. Surveys show that when people decide whether to answer an incoming call or ignore it, local numbers inspire more trust and confidence. Use your own experience to compare how consumers react when receiving calls from various types of numbers. A Software Advice survey unsurprisingly shows that 8 out of 10 respondents would be “extremely unlikely” to answer calls from unknown 800 numbers. This reluctance is explained by massive proliferation of telephone spam. Besides, cellphone number databases are sold and bought by various shady individuals ― a scammer can call to pry out some personal information and use it later for criminal activity. As for local numbers, 40% of the respondents indicated that they are likely to respond to a call from numbers with out-of-state area codes. In general, consumers have twice as much trust in calls from numbers with out-of-state area codes in comparison with toll-free numbers. All in all, for a small business operating within a single city, a local area number seems a more feasible solution offering tangible benefits. A geographically-diverse company with a small number of locations is likely to benefit from purchasing multiple local virtual phone numbers and uniting them under a single call-processing system. A toll-free option is more suitable for online enterprises catering for customers on a national scale. It seems quite logical, but some small business owners still opt for a freephone due to multiple sophisticated features usually included in a package. This avenue of thought poses a risk of bearing unnecessary expenditures: soon enough the owners discover that their communication costs have soared instead of reducing as expected. While it’s true that quality virtual phone services pack toll-free numbers with a host of features such as flexible forwarding, porting, caller ID and more, the same applies to local numbers as well. Better providers offer a toll-free number as an optional feature, which can be activated for an extra fee regardless of a chosen plan. Consequently, those who use local virtual numbers have exactly the same range of available features as their freephone-connected counterparts. Premium services such as an auto-attendant with custom voice menu, call masking and screening, flexible user and extension options, dashboards and detailed communication analytics ― you name it. A toll-free number is not a bad thing by any means. It offers exceptional connectivity with a geographically-scattered target audience and projects the image of prosperity and serious attitude towards business. Surveys show that detecting an 800 number on a corporate website considerably increases the conversion rate. What we know from all of this is that online companies have to utilize every possible opportunity to make their business look reliable. However, as long as your clientele is concentrated within a single area code, a local virtual phone number is a far better option. Just make sure you offer a number of alternative options for getting in touch with you from distant locations. With MightyCall VoIP, click-to-call widgets, call-back requests, instant messaging, call forwarding and so on are all possible options included in the plans. 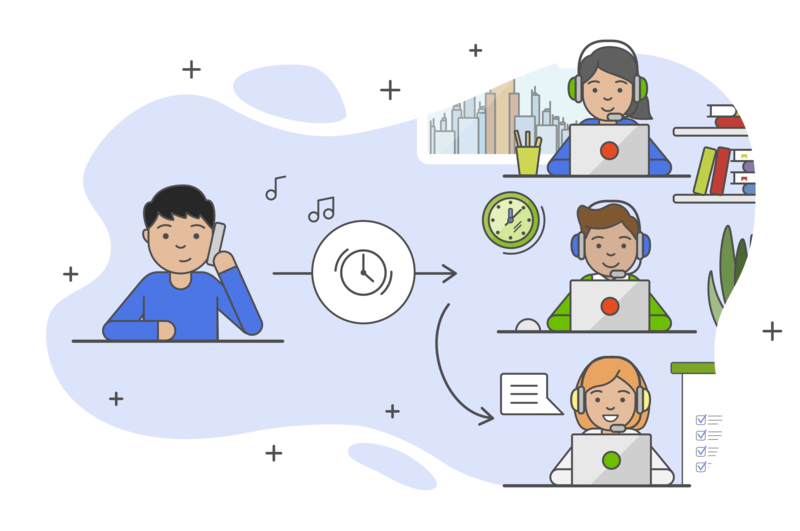 Yes, modern cloud-based call management solutions offer integration with all the above-mentioned tools, so you can monitor multichannel inbound activities from one place ― a web platform or a mobile application.